Introduction: Scott Phillips is a genealogical historian and owner of Onward To Our Past® genealogy services. 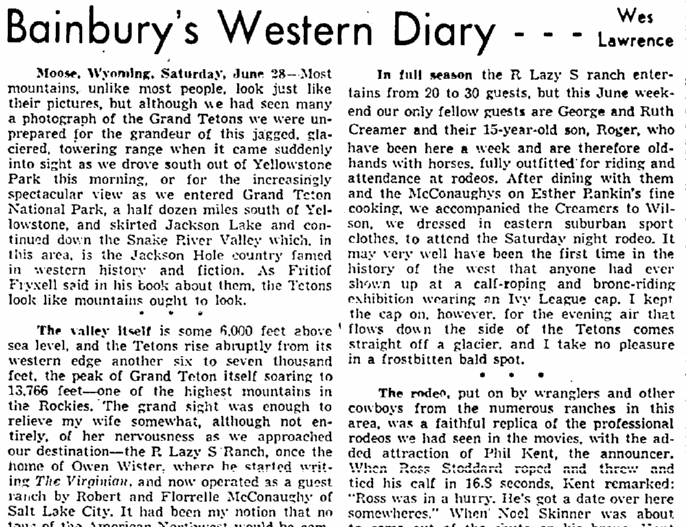 In this guest blog post, Scott reminisces about a wonderful vacation at a Wyoming ranch his family enjoyed when he was 11—and supplements his memories by searching in old newspapers for articles about the R Lazy S ranch. My mom passed away recently and as a son and genealogist, you must know that I have been doing a lot of reminiscing. Most often I have found myself thinking of all the things my mom taught me in life. She was a woman who moved with urgency and purpose, enjoying a wide variety of interests, and she cultivated those traits in my older sisters and me. One of the memories that came back to me was of one of our quintessential “family car vacations.” This one happened to be what the family still refers to as “Scott’s Summer Vacation.” My folks decided that my sisters and I needed to see the grand sites of the Western United States. I was bouncing-off-the-ceiling happy that our vacation destinations included such places as the Grand Canyon, Mount Rushmore, Petrified Forest, Painted Desert, several more U.S. National Parks, and concluded with a week at a “Dude Ranch.” Now, I will admit right here that my sisters were hoping more for Western sights such as Las Vegas and San Francisco, but off we went in the family station wagon—complete with the third seat facing rearward. The dude ranch was truly the highlight of the trip for me. For a boy of about 11, “real” cowboys, outhouses, a potbellied stove in my cabin, learning to rope a calf, and riding into the Grand Tetons every day simply could not be beat. Finally from my memory banks came the name of the ranch we stayed at: the R Lazy S. The brand, I still recall, was an upright “R” with an “S” on its side. 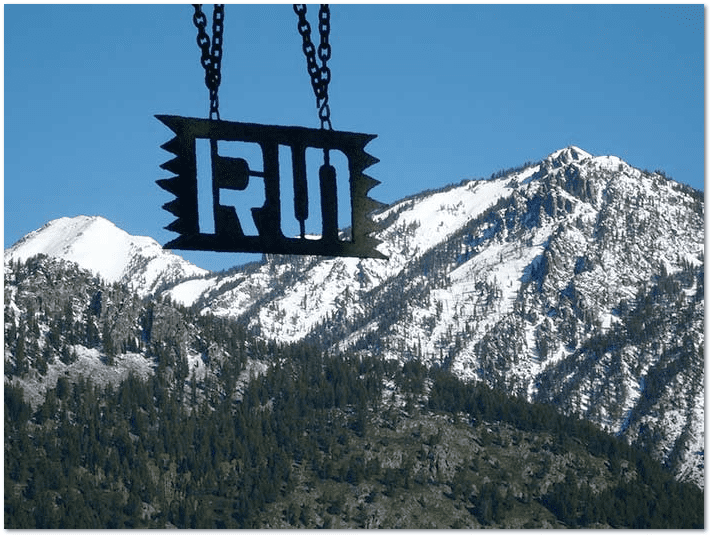 Photo: sign for the R Lazy S ranch, Jackson Hole, Wyoming. Credit: courtesy of the R Lazy S ranch. I wanted to find out more about this boyhood memory of mine, so I did a quick check of GenelaogyBank.com to see if there might be something. To my delight and surprise, on my first search in GenealogyBank’s Historical Newspaper Archives I got results! Smiling from this find, I looked further into my results and quickly found a 1958 travel article from my Cleveland, Ohio, hometown newspaper. Immediately I wondered if my mother had read this article—had it been the genesis of the plans for our family vacation? I had a good laugh when I read this author’s description of the R Lazy S ranch that included “luxury cabins.” Now perhaps I was in the wrong cabin, but mine was outside the gate, had only a potbellied stove for heat, and the outhouse was a good 200 yards away. But perhaps “luxury” is in the eye of the beholder! 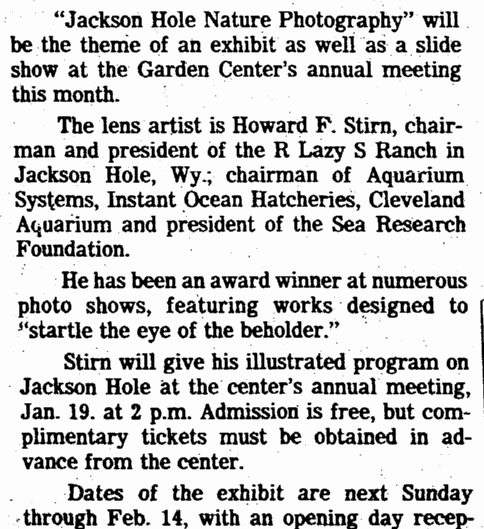 Next I discovered a newspaper article from 1982, again in the Plain Dealer, explaining that Mr. Howard F. Stirn, then chairman of the R Lazy S ranch, was in Cleveland to present a photographic exhibit of Jackson Hole, Wyoming, and the surrounding area. I’m wondering if perhaps there was a connection between the R Lazy S ranch and my hometown. This may be one of those many questions in our family histories that we are never able to fully answer (and is a good reason why preserving our stories and memories onto our family trees is so crucial). With my head full of wonderful memories and our crazy family song (which we all made up along the way and called “Touring Our Country: Monuments and Parks”), I searched Google to see if the R Lazy S ranch is still in existence. Guess what—it is! You can see at http://rlazys.com that they are indeed alive and kicking like a bronco. Hmm, maybe it is high time for a family vacation…back out to Wyoming and the R Lazy S ranch with our grandsons. I do believe, as a proper grandfather, I need to share my memories with my grandsons in person, especially since the Ranch looks far less “rustic” than back in my day! What were your favorite family vacation destinations growing up? We’d love to hear your personal vacation stories. Share them with us in the comments. I was one of the lucky children of the late 60’s and 70’s my Grandparents Ed and Katie Larson of Meeteetse Wyoming ran the Homestead dude ranch on the Upper Greybull river. I grew up in this life style and greatly enjoyed all the people who came for fishing or hunting. Lucky indeed, Cindy! How wonderful that life must have been. Nice to know that some of the ‘local folks’ didn’t mind us tenderfoots who came to see ranch life and enjoy what you had for a few short weeks. A few years back I read an article, which I will have to try and find in ‘True West’ magazine. It was on a dude ranch/hunting lodge called The Homestead near Meeteetse that doubled as a place for very sick children to have a get away. I wonder if it was the same ranch as your family’s? Could be a very small world! Thanks for sharing such a wonderful memory! Thanks Scott for a great article. The R Lazy S Ranch is still in existence even though it is in a slightly different location, but a better one. We are now on the southern boundary of the Grand Teton National Park but still on the Snake River. 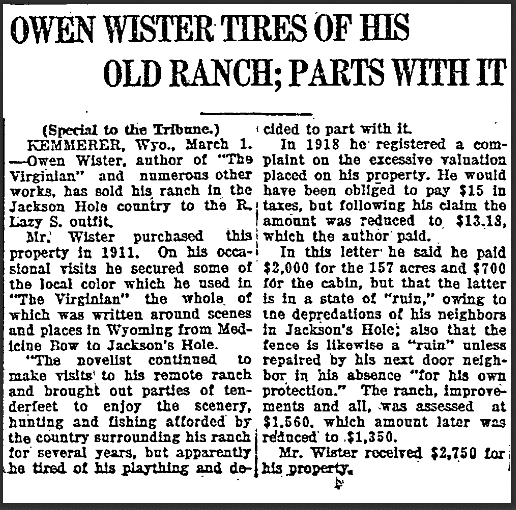 The property owned by Owen Wister is now owned by the park and is directly next to the Rockefeller Preserve (http://www.nps.gov/grte/planyourvisit/lsr.htm). The ranch is in it’s 3rd generation of ownership with Nancy and Kelly (Howard Stirn’s son) as owners along with their sons, Matthew and William as co-owners. Everyday, we take rides into the park, exploring the rivers, lakes, and fields in the park. Come back and visit us someday soon. How wonderful to hear from you! As you can tell I have marvelous memories of our trip to R Lazy S! Come back? You bet. I am talking with my children to see when we should schedule a family reunion for all of us at your ranch! Just have to get the smallest grandchild a bit older! I want him in a saddle too! Thank you for reading and for the update. Keep up the great work at such a marvelous place!